ATR is a measure of volatility. It shows you how much a particular stock moves (on average) in a day over a certain period of time (adjusted for gaps). A trader can use ATR to place a stop-loss on a relevant technical place. Placing your stop-loss at two or tree ATR reduces the chance of being unnecessarily stopped out due to normal “fluctuations”. In Chartmill you can add an ATR based stop to your charts by adding a “chandelier exit” to your chart. Third parameter – (0) = initial level for the stop. Once the moving stop value becomes higher than the initial stop, it will take over. This parameter is 0 by default and is optional. 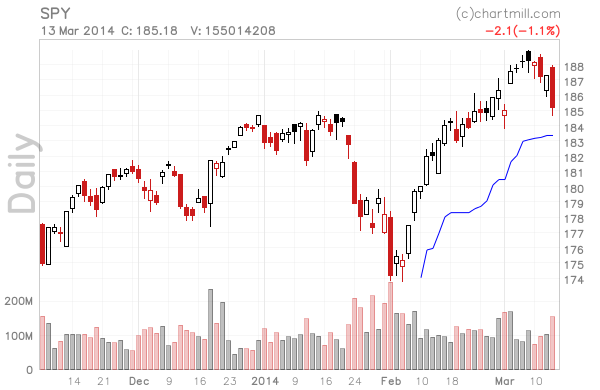 Example: SPY chart with a chandelier exit of 3x ATR that begins 26-days ago.